First off, let me give a big hearty thanks to Jazzfeathers. Her nomination means a lot to me. She’s been with my blog since the beginning, and I really appreciate that–plus the fact that we write about similar stuff! Everyone can–and should–check out Jazzfeather’s awesome writing blog, The Old Shelter, where she offers up interesting book reviews, great writing advice, snippets of her novels and all sorts of great things. 1. Thank the blogger who nominated you. Check! 2. List the rules and display the Award. Check! 3. Share seven facts about yourself. See below. 1) I’m an artist as well as a writer. I’ve got a BA in Studio Art, with a focus in Sculpture, but I mostly draw and paint. While I’ll draw almost anything, I particularly like to draw animals and landscapes. 2) I’m learning to read Egyptian hieroglyphics. I’ve been fascinated by Ancient Egypt since I was a small child, and I’ve always wanted to learn the language. Turns out, it is in fact possible for someone to learn it without getting a PhD in Egyptology. So, I bought some books and started studying. Ancient Egyptian is a beautiful language, both visually and conceptually, and I love translating it. Hearing a voice speak from over a thousand years ago is a magical thing. 3) Besides working full time in an unrelated field, I also freelance as a graphic designer and a copy editor. While I’ve been doing graphic design work for a long time, I’ve only recently gotten into copy editing in the past couple of years. At the moment I’m getting an editing certificate from a local university. 4) I’m a passionate crafter. It’s a hobby and a bit of a profession, too, since I’ve actually managed to sell some of the things I’ve made (I’ve sold art, too, but I count that differently). My crafts cover a broad range, from painting coffee cups to making sock animals. Last year I took up knitting for the first time, and now I love it. Right now I’m making some green socks for my mother. 5) I was born very premature. They tell me I’m lucky to be alive. All the other babies in my ward died. 6) I absolutely hate cooked carrots. 7) I love wolves and I give money to Wolf Haven International every year. 4. Nominate other amazing blogs and comment on their blog to let them know you nominated them. See below. 1. Blogger Undine and her “weird history” blog, Strange Company, is definitely worth a nomination! It’s a treasure trove of wonderfully strange, esoteric bits of history which are always compelling. She has another blog as well, The World of Edgar Allen Poe, which is just as interesting. 2. Author Mary Miles Theobald’s Roaring Twenties blog is also wonderful. It’s chock full of excellent, interesting historical information about the 1920s while also connecting readers to her mystery series set in 1925. I’m reading her first book in the series, The Impostor, right now and it’s ab-so-tive-ly po-si-lute-ly fabulous! I would highly recommend it and the series as a whole to anyone who likes a good historical mystery. This entry was posted in blog award and tagged blogging award, Very Inspiring Blogger Award. Bookmark the permalink. 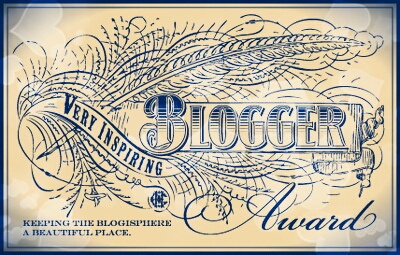 1 Response to The Very Inspirational Blogger Award!